Sternreiter clocks employ the best available cabinetry and clock mechanisms in the world. The Brahms tambour has proven to be a most popular model, and is well loved by clock connoisseurs. This timepiece exhibits the finest wood finish available, and features details of the finest quality. Special brass hinges on the rear door allow access to the solid-brass, German-made mechanism and chimes. The easy-to-read dial is metal with a brass and crystal-glass bezel. Its easy to see why this inexpensive piece is regarded so well. It is an excellent example of the finest craftsmanship inside and out! It is an heirloom piece, destined to last for generations. The Brahms is by Sternreiter and is available with cherry finish, oak finish and with either mechanical or quartz mechanisms. Beautiful Tambour clock in an oak finish with a triple chime quartz movement that plays Westminster, Ave Maria, and Bim Bam with automatic night shut off. Dimensions: 18.5 x 11.5 x 6.5 inches. Taking hues of the cherry shade, this quirky Sternreiter Brahms Quartz, Tambour Mantel Clock is a functional wall accent for your home. Assembled in Ohio, this clock is the brainchild of German watch makers. 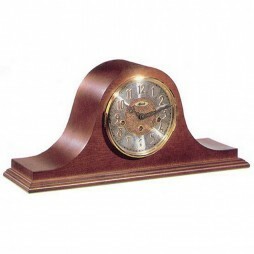 This quartz clock features an American cherry finish. This clock is a super sleek finish with its front bezel crafted from brass and crystal glass. It has the most interesting white dial with graceful hands and Arabic numerals. 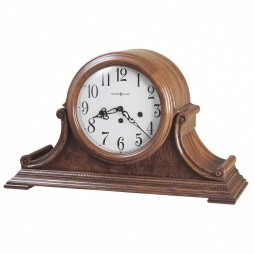 Lay your hands on this solid wood quartz mantel clock with Westminster chime today and breathe grace onto the walls of your home! Available in oak color, this unique Verdi Mechanical Tambour Mantel Clock has German-made mechanism and dial. Assembled in the U.S.A. with the brand name Sternreiter, the clock showcases the finest artwork of the amazing and talented designers. The Quality construction with hinged, heavy cast brass bezel, brass hinges and Westminster chime on long steel chime rods catches the attention of people and makes it stand out from rest of the clocks in the market. So, invest your money in buying this exquisite clock that will make the walls of your house beautiful. With German-made mechanism and assembled in the U.S.A, The Verdi Mechanical Tambour Mantel Clock is crafted by and carved by experts of the industry. This elegant wood clock comes with Westminster chime on long steel chime rods, heavy cast brass bezel, brass hinges, and heavy cast-brass bezel, enamel dial. 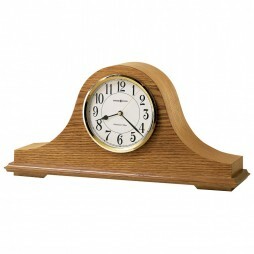 The clock is provided a great finishing look by American cherry or oak color. It comes with two-year warranty and original Sternreiter trademark. So, bring this beautiful clock at your home and awestruck your guests. Gorgeously detailed, the Bradley Key Wound Chiming Mantel Clock is finished in a buffed Windsor Cherry with 15 different species of hardwoods and veneers. The embellished dial showcases a silver chapter ring with applied satin black numerals surrounding an ornate pierced and polished brass cast center. Only two thousand of these clocks will be crafted! Two year warranty and Free Shipping. Buy with confidence! 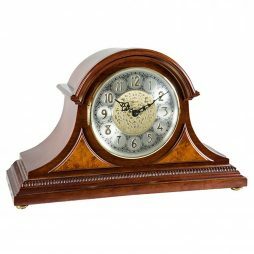 The Barrett II Key Wound Mantel Clock has the construction and beautiful styling of the original, but in an Oak Yorkshire finish. This tambour mantel clock has decorative egg-and-dart molding around the base and olive ash burl overlays on the front. 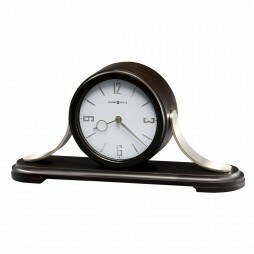 View the complex solid brass clock movement through the arched glass top. The ornate silver-finished dial features applied Arabic numerals and a brass-finished chapter ring. This timepiece features an industry exclusive dual-ratchet winding arbor that ensures save movement winding. 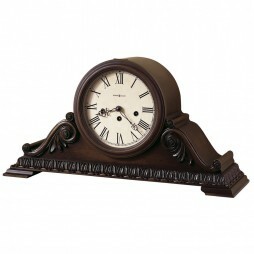 An intricate and timeless piece, the Barret Key Wound Mantel clock abounds with details. Constructed in select hardwoods and veneers with a Windsor Cherry finish, the base features egg-and-dart molding and the front is accented by olive ash burl overlays. 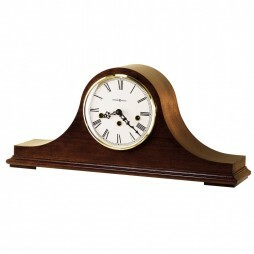 View the complex solid brass clock movement through the arched glass top. The ornate silver-finish dial features applied Arabic numerals and a brass-finished chapter ring. This timepiece features an industry exclusive dual-ratchet winding arbor that ensures save movement winding. Enjoy Westminster 1/4, 1/2, and 3/4 chimes accordingly with the full chime and strike on the hour. Infuse your home with a sedate elegance reminiscent of the early twentieth century. With a style which is both delicate and alluring, the Hermle Sweet Briar Tambour Mantel Clock (With Key Wind Movement and Cherry) will certainly add the charm of an era renowned for its glamour and style. 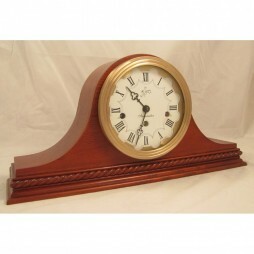 In addition to its case in a cherry finish with rich warm, tones, this household item also features large Arabic numerals which stand out against its white, glass covered face, which is surrounded by a brass bezel. 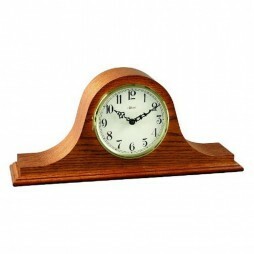 The Hermle Sweet Briar Tambour Mantel Clock (With Key Wind Movement and Oak) in a medium striated oak finish and a classic design, will make a welcome addition to any mantelpiece in your home. Created by none other than the renowned clock maker, Hermle, it features smooth, simple lines, Arabic numerals against a white face and stylized hands. This tambour clock has also been fitted with a mechanical brass 8-day key-wound movement that plays 4/4 Westminster chimes. There are fewer things which are more convenient that a household item that can fit right in with almost any colour scheme of your choosing. The Scottsville Mantel Clock (With Quartz Movement and Cherry) is one such item. 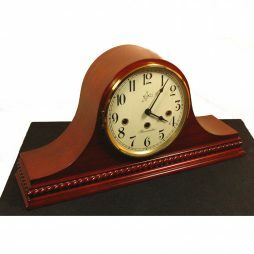 The tambour clock which comes in an elegant cherry finish featuring hand carved side appliques and beaded molding across its base will make the ideal addition to any room, thanks to its simple, yet classic design and the neutral colours of its face and case. This mantel piece item also comes with a quartz dual chime movement which plays either Westminster or Bim Bam chimes. 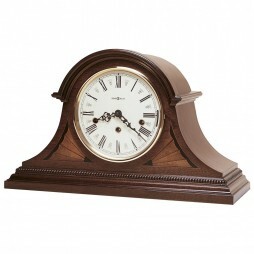 Invite a subtle charm which will add a touch of classic style to your home with the Scottsville Mantel Clock (With Quartz Movement and Classic Oak). A tambour clock in a classic oak finish with hand carved side appliques, this household item also comes with a quartz dual chime movement that plays Westminster or Bim Bam chimes and will lend an air of delicate refinement to any surface it is placed upon. Combining classic design and a subtle allure, the Hermle Laurel Tambour Mantel Clock (With Key Wind Movement and Cherry) is the ideal ornament for any mantel piece in your home. Embossed golden numerals lie against a silver background while the clock face itself has been set in a traditionally styled tambour case with a cherry finish. The clock also comes with a mechanical brass 8-day key wound movement which plays 4/4 Westminster chimes. Invite a hint of sedate style and antique elegance to your home with the Hermle Laurel Tambour Mantel Clock (With Key Wind Movement and Classic Oak). This Traditionally styled tambour clock in a classic oak finish also comes with a diamond turned chapter ring dial with embossed Arabic numerals as well as a mechanical brass 8-day key wound movement which plays 4/4 Westminster chimes. Make your mantelpiece look extra special with the one household item which has been designed for that very purpose, the Amelia Mantel Clock (Quartz Movement and Elegant Cherry). 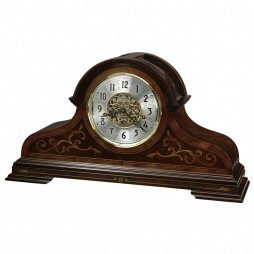 Featuring a polished cherry frame on brass feet with raised burl veneer panels which highlight the stylish design of its golden and silver face with black hands, the mantle clock also comes with a quartz dual chime movement which plays either Westminster or Bim Bam chimes as well as volume control and a personalized night shut-off. Enliven the dcor of your lounge, bedroom or any other convenient space with a graceful refinement evocative of the 1930s, an emblematic era in clock making. Brought to you in smooth brown polished cherry, an ornate dial in golden and silver accents and stylized hands, the Hermle Amelia Mantel Clock clearly reflects the dedication and skill invested in its manufacture by the renowned German clock maker Hermle. In addition to its brass feet, raised burl veneer panels and beaded molding across the bottom, this decorative mantle clock also features a mechanical brass 8-day key wound movement which plays a 4/4 Westminster chime. Add a touch of brightness to your mantelpiece in hints of polished oak and golden and silver accents, thanks to the Hermle Amelia Mantel Clock. The alluring household item which features raised veneer panels and beaded molding across its base also comes with brass feet as well as a mechanical brass 8-day key wound movement which plays a 4/4 Westminster chime. Enhance your mantel or bookshelf with the modern style of the Callahan Contemporary Chiming Mantel Clock. Designed from wood and metal with curved brushed nickel metal sides, the clock is finished in a rich Black Coffee finish over select hardwoods and veneers. The white dial is complemented by embossed, satin nickel finished Arabic numerals and hour markers with matching hour and minute hands. It features a black minute track, wood bezel and convex glass crystal. Enjoy the quartz, triple-chime Harmonic movement that plays a choice of full Westminster or Ave Maria chimes with strike on the hour (1/4, 1/2, 3/4 chimes accordingly; Westminster o chime and strike on the hour only; or Bim Bam chime on the hour only). The clock features a volume control and automatic nighttime shut-off option. Let the vintage charm walk into your home with this Sternreiter Brahms Quartz, Tambour Mantel Clock. 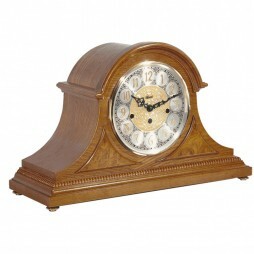 It is a fantastic traditional mantel clock that has a glossy American oak finish. 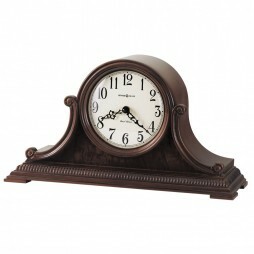 Assembled in Ohio, the precision of this clock has been applauded by several customers. Owing to its German-made quartz mechanism, this telltale is an exemplary piece of craft. The front bezel is made of brass and crystal glass while the rear comes fitted with brass hinges. This clock is an amalgam of German design and American workmanship. Get this one at a super-affordable price right away. 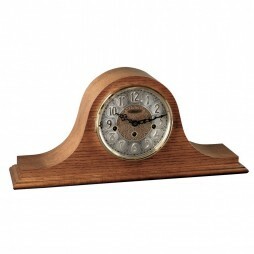 Hang up this traditional tambour shaped mantel clock in your room for a new look. The off-white dial offers a convex glass crystal, polished brass finished bezel, black Roman numerals and brass second hand. Finished in Windsor Cherry on select hardwoods and veneers. This pretty piece of decor can be a perfect gift. 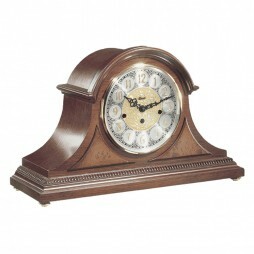 Attractive and natural looking, this Howard Miller Humphrey Tambour Mantel Clock is a perfect addition to your room. The aged dial of this smaller profile tambour style mantel clock features Roman numerals and spade hands beneath a convex glass crystal. Felt bottom protects your desk or tabletop. Quartz, time only, Non-Chiming battery operated movement uses 1 AA battery. Made from high quality material, this piece is a smart option for a gift as well. An elegant pick for your living space, this Howard Miller Sophie Chiming Mantel Clock will look great on the walls of your home. 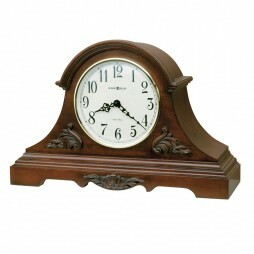 This special 82nd Anniversary Edition mantel clock in in Americana Cherry offers decorative details include carved leaf and rosette overlays and a burl front panel. A lambswool dial offers black Arabic numerals and black serpentine hands, behind a convex glass crystal. The innovative styling of the Mantel clock makes it a must-have for every homeowner. 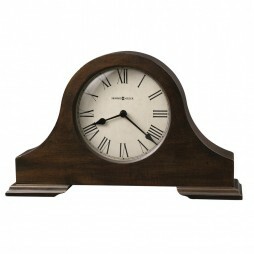 This Howard Miller Downing Tambour Chiming Keywound Mantel Clock from Clockshops is a sure shot buy for modern homes. Modified tambour finished in rich Copley Mahogany with exquisite ebony and maple fan marquetry. A rich arch molding graces the front and sides of the case. Cream colored dial offers black Roman numerals. Beaded dentil molding adds character to the strong plinth base. Order now and get ready to be amazed. Designed with a prominent style, this Howard Miller Newley Classic Tambour Mantel Clock will instantly increase the vibrancy of your interiors. A larger, classic tambour silhouette with beautiful details gives this mantel clock a unique presence in any room. The base features a decorative molding that wraps around three sides of the clock, while detailed, bookmatched leaf and rosette patterns flank the bezel and dial. The aged parchment dial features Roman numerals, black spade hands, convex glass and a hinged bezel. Rich in details, this 78th Anniversary Edition tambour style mantel clock is sure to add beauty and charm to your place. A beaded molding surrounds the base, accenting the carved side scrolls and olive ash burl veneered front panel. Beneath a convex glass crystal, the lambswool dial offers black Arabic numerals, black serpentine hour and minute hands. Aesthetic designs can instantly add thematic touch and vibrancy to your home interiors. Thats why Clockshops brings to you this Mantel clock, which has been designed to add a contrasting and thematic effect on your interiors. Finished in Oak Yorkshire on select hardwoods and veneers. Rare triangular Carpathian elm burl overlays. Beaded dentil molding above the full plinth base. Cream colored Roman numeral dial with convex glass crystal and solid brass, diamond cut hinged bezel. Unique design, stylish contours and fine finish make this wall clock a welcoming addition in any place. Windsor Cherry finished mantel clock in the traditional tambour styling features decorative top molding and triangular elm burl overlays. Beaded dentil molding wraps around the sides and front above the full plinth base. The off-white dial offers black Arabic numerals with serpentine hands. The convex glass crystal is framed by a hinged, solid brass bezel with beveled polished top surface and diamond turned sides. Add an artistic touch to your walls, with this beautiful Howard Miller Mason Tambour-Style Keywound Mantel Clock. 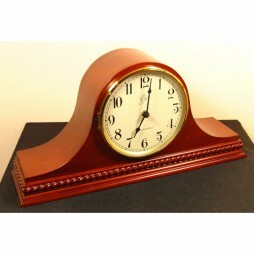 It is a tambour-styled mantle clock with Windsor Cherry finish on selected hardwoods and veneers. The special inscribed dial is off-white with a brass finished bezel and Roman numerals. German made Kieninger Key-wound Westminster chime movement needs winding only once per week. The thematic and minimalistic product has been designed to be a fascinating addition to your dcor. Choose your spot on the wall, and this Howard Miller Mantel Clock will make a lovely classic piece to tell you the time of the day. 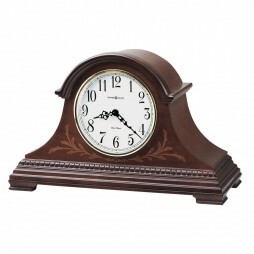 Finished in Windsor Cherry on select hardwoods and veneers, this mantel clock features decorative molding that wraps around the base and detailed fan overlays that frame the dial. With a combination of old world styling and a sleek modern design, this clock blends well with both modern and traditional interiors. Cut the time in purchasing and get a piece now. If you have a modern styled home, then this Howard Miller Tambour Mantel Clock will surely be the perfect investment for you. Crowned with a attractive molding and features rare triangular, Carpathian elm burl overlays. Off-white dial has Arabic numerals and polished brass bezel. A beaded dentil molding surrounds the sculptured base. Finished in Windsor Cherry on select hardwoods and veneers. Designed beautifully, it is a striking, minimalistic addition that can light up your decor. Chic, modern and stylish, this Howard Miller Tambour Mantel Clock has a universal appeal that will intrigue one and all. This lightly distressed mantel clock is embroidered with classy details. Carved overlays frame the tambour dial and decorate the cutout base, while an arched molding crowns the top. An off-white dial features crisp black Arabic numerals and serpentine hands. Adding the perfect level of sophistication to your interiors, this beautiful Howard Miller mantle clock is finished in Americana Cherry on select veneers and hardwoods. Sporting an abstract pattern on the rim, the Howard Miller Burton II Tambour Mantel Clock is sure to add modish touch to your decor. This special anniversary edition tambour mantel clock features decorative top molding and triangular burl overlays. Finished in Windsor Cherry on select hardwoods and veneers. Made using high-quality wood, it is easy to maintain and long-lasting. Sporting appealing look, it will blend well with your interiors adding to its beauty. Add a vibrant touch to your decor by installing the Howard Miller Albright Tambour Mantel Clock from Clockshops. This 77th Anniversary Edition tambour mantel clock is rich in details. A beaded dentil molding surrounds the base, accenting the carved side scrolls and burl veneered front panel. Beneath a convex glass crystal, the aged dial offers black Arabic numerals, black serpentine hour and minute hands, and a special 77th Anniversary inscription. 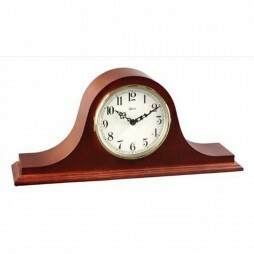 Designed to look classy and to last for a longer time, this wall clock is sure to earn you compliments for your high-end choice, it is made using premium-quality wood. 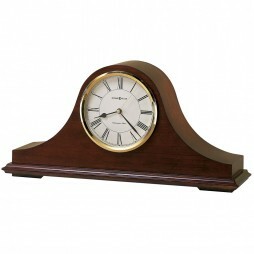 Keep a track of time with the Howard Miller Hampton Tambour Mantel Clock. Made from high-quality material, this classic mantel clock is highlighted with book matched oak molding that frames the dial and offers scrolls on the sides. The aged dial offers Roman numerals and a beaded molding accents the front and sides. Finished in urban casual cherry on select hardwoods and veneers. Automatic nighttime chime shut-off. 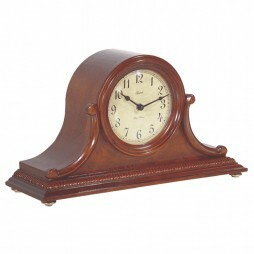 Adorn your wall with this attractive and completely efficient Howard Miller Palmer Tambour-Style Mantel Clock. This 78th Anniversary Edition tambour style mantel clock is rich in details. A beaded molding surrounds the base, accenting the carved side scrolls and olive ash burl veneered front panel. Beneath a convex glass crystal, the lambswool dial offers black Arabic numerals, black serpentine hour and minute hands. Access to the dial is easy as the entire wood bezel is hinged from the top and lifts upward to wind the clock. One Year warranty and Free Shipping. Styled with bold numbers on the dial, Howard Miller Hillsborough Oak Dual Chime Mantel Clock will look good with any home decor. This contemporary clock is highlighted with bookmatched oak molding that frames the dial and offers scrolls on the sides. The ivory dial offers Arabic numerals. A beaded molding accents the front and sides. Finished in Dark Oak Yorkshire on select hardwoods and veneers. Automatic nighttime chime shut-off between 10:00 pm and 7:15 am. Quartz, dual chime movement plays Westminster or Ave Maria chimes, and features volume control and automatic nighttime chime shut-off option. 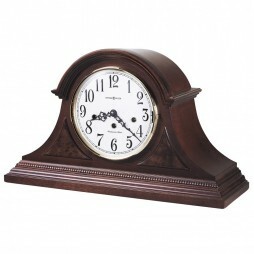 The attractive look of this clock makes this a perfect choice for gifting someone. Spending time with family is incredibly important. But in today’s world, it can be harder than ever to get everyone in the same room once in a while, let alone on a consistent basis. Life is hectic, schedules must be kept, and less and less time is spent in each other’s company. Well give everyone a reason to gather together again as a family by making your house a warm and inviting home. 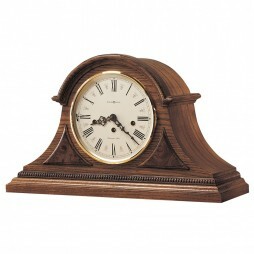 Spruce up your home decor, and enhance your mantel with one of our elegant tambour clocks. Expressions of Time is dedicated to serving our customers, and we stock our inventory with only the best pieces to make your home feel comfortable and heartwarming. So browse through our selection of beautiful timepieces on ClockShops.com, and bring your family room and fireplace to life again. With reputable brands behind every one of our products, and custom designs you won’t find anywhere else, you can rely on the dependability and visual beauty of every clock we have in stock. So what are you waiting for? Shop our stunning collection today! Bring home that essential timepiece and give your family a warm place to gather and connect again. Tambour clocks have a beauty and finesse about them that have made their style customary in homes for decades. They bring a sense of sophistication and class wherever they’re put on display. Isn’t it time you invested in one? Give your home decor a traditional piece that will also easily blend into more contemporary living spaces. Tambour clocks never got out of style, so pick one up today and keep it in the family for generations to come! 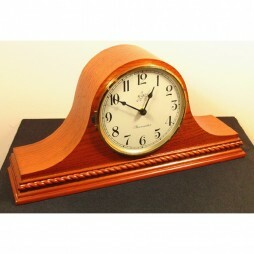 The tambour style makes a fantastic decorative item, great for calling attention to a once-neglected area of the home. Mantel clocks are distinguished among others for being more intricately built and more ornately designed than any other models on the market. Therefore, they create stunning visual displays, ready to join your mantel’s ensemble of other splendid trinkets and baubles. Family reunions, holidays, and other important family gatherings will never feel the same after your social space receives its gorgeous makeover! So give yourself the chance to enjoy the finer things in life. 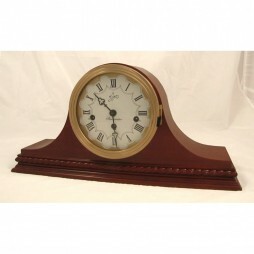 Shop through ClockShops.com and find the tambour clock fitting of your personality. Considering their distinctive shape, tambour clocks certainly stand out from the rest. They generally have a lovely round dial at their center, and beautifully-carved, sloping ends. And with added features like melodious chimes, volume control and automatic night shut-off availability, the traditional timepieces live up to their prestigious reputation. Start off with something truly exquisite, like the Howard Miller Webster Tambour-Style Mantel Clock. The dial itself is picturesque with intricate vine patterns surrounding the Arabic numerals, and a Presidential insignia included. The arch molding adds that extra bit of elegance, while the mahogany and satinwood overlays give the timepiece some brilliant coloring. Give your home an antique feel with the Howard Miller Hampton Mantel Clock. 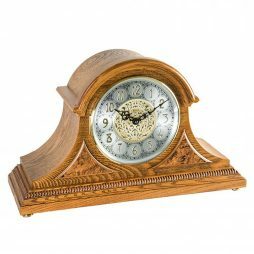 Perfect for placing on your bookcase in your library, home study or office, this timekeeper shows off classic oak molding and scrolling features attached to either side of the dial. The beaded molding along the base of the tambour clock is especially lovely, adding timeless fashion to a piece worthy of a spot in anyone’s home. Make a real statement with the Sternreiter Brahms Quartz Tambour Mantel Clock. This vintage model has a glossy, American oak finish that brightens the entire timepiece and really draws the eye, wherever it rests. Created from both German and American clockmaking expertise, you can’t have anything much finer than this stunner sitting over the fireplace. And you’ll be happy to amp up the shine in your home with the Hermle Laurel Tambour Mantel Clock, with Key-wind included. 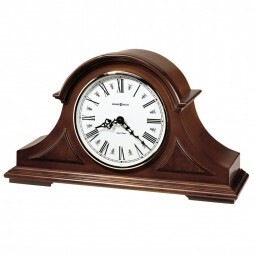 With a sleek, modern design and a cherry finish, this timepiece will outperform anything else on your mantel. Whether you want something traditional or contemporary, chic or vintage, we have all the styles you’ll be searching for right here at ClockShops.com. Family and friends will be ready to bust down your door when they get a glimpse of your new home decor! And with a stunning tambour clock rounding out the new style on your mantel, you won’t ever see a frowning face in your living space again. Expressions of Time only collects the optimal timepieces in a market full of contenders. We have experts on hand using their artistic eye to choose only the very best for our inventory. You won’t be disappointed with what we have to offer! So stop in for a quick scroll through our merchandise; but don’t be mad at us when you end up staying awake far past your bedtime trying to pick your favorite! Our store is full of reputable brands, including Howard Miller, Hermle, Bulova, and Sternreiter; names that stand for quality and precision with each one of their delightful models. Tambour clocks hardly need much help embodying sophistication, but if anyone can make them even more marketable, it’s companies such as these. Their devotion to elaborate design styles and expertly-crafted technical work has put them ahead of the industry for a reason. And Expressions of Time guarantees you’ll love your new purchase. But, if for some reason you are dissatisfied, we kindly offer a 60-day return policy on all items. Need any more perks? The shipping is free as well, for those in most states within the continental U.S. Our already affordable prices come with no hidden fees. So stop what you’re doing and settle in for some time on ClockShops.com. You (and your lackluster mantel) will be glad you did.